Finally the new PICDEM-Curiosity (DM164137) board is here! It’s available on MicrochipDIRECT, at most distributors and online catalogs in stock. There have been a few changes since the first prototype was shown to me during the final edits of the Rocket Science book, but mostly cosmetic. The board is very compatible with the PICKit3 Low Pin Count + MikroBUS© project (I called it Simplicity at some point) except technically you don’t need the PICKit3 anymore as part of the circuitry is already present on (/under) the board itself. All you need is a USB cable (provided) and a PIC16F1 (samples of the PIC16F1619 are shipped with the board). This is a great choice as the ‘1619 has a lot of interesting Core Independent Peripherals to play with: CLC, PPS, SMT, Angular Timer, HLT, Math Accelerator.. you name it! In fact you will be able to try most of the projects I developed [link] for Simplicity as is, provided you get hold of a PIC16F1709 which I used back then or rebuild the projects for the ‘1619 (using MPLAB X – MCC it’s a breeze). 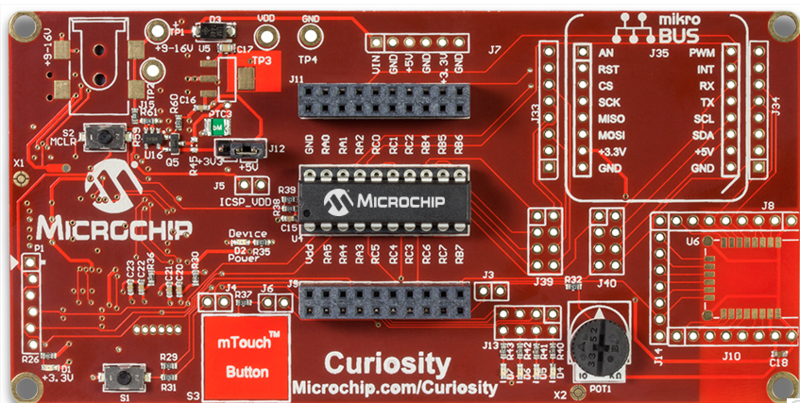 More projects are available directly from the Curiosity Design Center on the Microchip web site. The on chip programmer (PICKOB) circuit can only operate in Low Voltage Mode. Make sure to always keep the PIC LVP configuration bit enabled in your Curiosity projects! The mikroBUS connector for Click© boards is not populated (see figure above, board right top corner). You will need to get yourself a pair of female 100mils strips and solder them on to start prototyping. An optional PICKit3 (ICSP) connector and 9V power supply regulator are available but not populated (top left corner of the board). By default the board will power from the USB connector. An additional Bluetooth LE (RN4020) module can be soldered directly on the board (lower right corner) to provide some interesting wireless connectivity options, but keep in mind that will use up the UART connection that is shared with the MikroBUS interface. This entry was posted in PIC16, Tools and tagged Books, CIPs, Click, MCC, PIC16, RocketScience. Bookmark the permalink.